What now for the Federal Reserve? The US economy is in its ninth year of expansion yet consumer prices have risen just 14% in total during this period. 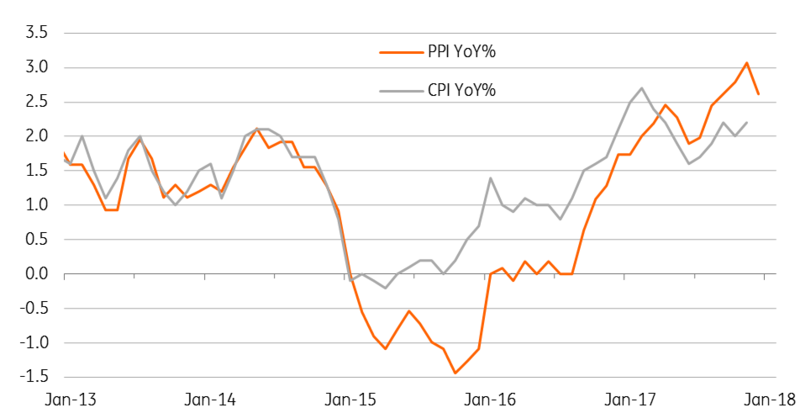 Even now headline consumer price inflation is running at slightly above 2% YoY while stripping out food and energy the core rate of inflation is only 1.7% YoY. The personal consumer expenditure deflator series suggest price pressures are even more benign. Consequently, the traditional belief that diminishing spare capacity should generate price and wage pressures has started to be questioned. So what is going on, will things change and what does it mean for the Federal Reserve? These structural shifts have also impacted wage inflation. The US is largely a services sector economy and wages are the key driver of service-sector price inflation. Wage growth is just 2.5% YoY despite unemployment being at a its lowest level since 2001 (when wage growth was running at 4% YoY). This has raised questions over whether the Phillips curve - the trade-off between wages and unemployment – is dead, broken or has merely shifted. After all, we are in an age where more and more workers are employed on short-term insecure contracts and the power of trades unions to influence pay rates has been greatly reduced. Despite these structural issues, Janet Yellen described the fact that inflation had slowed in 2017 as “more of a mystery”. Reasons were described as “transitory” and “idiosyncratic” and include slower increases in healthcare costs, attributed to mandated cuts in the growth of Medicare payments, and also the introduction of unlimited data plans provided by cell phone providers early last year. While not resulting in actual price cuts, the fact that CPI is hedonically (quality) adjusted - you are getting more for your money - led the Bureau for Labour Statistics equating this data giveaway as a 13% price drop. This was enough to knock 0.3 percentage points off the annual rate of core inflation. Friday’s CPI report is not expected to result in any real changes with headline inflation probably dropping to 2.1% on energy and core inflation remaining at 1.7%. However, we think that we may be on the brink of a major shift. Commodity prices are rising and the dollar’s 10% depreciation since President Trump’s inauguration are pushing up import and producer price inflation. These pipeline price pressures are also reflected in the likes of the ISM business surveys. Then those idiosyncratic factors that the Fed highlighted for 2017 are going into reverse. 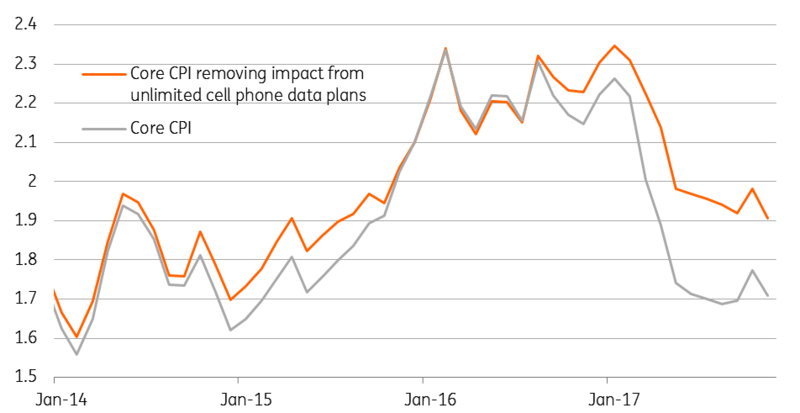 The impact from last year’s introduction of the unlimited data plans will drop out of the annual price comparison in March/April. This will automatically push annual core inflation up by 0.2/0.3 percentage points. We are also increasingly confident that wages will finally respond to the tightness of the jobs market. Firms are issuing more and more warnings of skills shortages. This is being acutely felt in the small business sector, which accounts for half of all employment in the US economy. The National Federation of Independent Businesses reported that a net 23% of its members plan to raise the compensation rates for employees over the next three months – the highest reading since December 1989. It is also important to point out that the NFIB also report a sharp uptick in the proportion of businesses looking to raise prices. In an environment of strong growth – we expect the US economy will expand 3% this year given strong domestic momentum, supported by tax cuts, and a rapidly improving external environment – we think this price pressure will grow. The result is that we expect headline inflation to head towards 3% by the summer with core inflation breaking consistently above 2% in 2Q18. On the face of it, a strong growth, low inflation environment is what all central banks aspire to achieve, but the fact interest rates remain so low is causing some unease at the Federal Reserve. Outgoing Fed Chair Janet Yellen warned last September that “persistently easy monetary policy might lead to increased leverage and other developments, with adverse implications for financial stability”. Fed officials have also suggested that the extreme length of the current economic cycle means the US may not be that far away from the next downturn. Given interest rates are so low and the Fed’s balance sheet remains huge the US has less ammunition to stimulate the economy relative to previous cycles. This clearly hints at a desire to see higher interest rates in the US and helps explain why Janet Yellen has repeatedly warned of being “wary” of raising interest rates “too gradually”. Even though she is leaving the Federal Reserve next month, the Fed’s dot diagram clearly signals an appetite amongst the membership to raise rates three times this year. This suggests her cautiously hawkish stance is widely shared. Admittedly there is very vocal dissent from a small minority, most notably Neel Kashkari and Charles Evans, but neither will be voting at this year’s FOMC meetings. With inflation likely to push gradually higher the Federal Reserve is set to respond. However, the imminent changes at the top of the FOMC could result in a pause in the first quarter as Jay Powell finds his feet. There's also some uncertainty as to how the recent bad weather has impacted the economy. With core inflation set to remain below 2% in the current quarter, the Fed may choose to “wait and see” despite the market currently pricing a 75% chance of a hike by the end of March. However, we do expect interest rate rises in the second, third and fourth quarters. The Fed’s emphasis on financial stability risks from loose monetary policy and the fact financial conditions remain loose (flat yield curve and weaker dollar) means we see the risks skewed towards more, not fewer, rate rises.